I will reply email when I send a package. And, AGR's pages are now postponed due to additional investigation. I don't know if there are days with runway repairs or something, but the first week of April will be risky. That is to say, the financial year in Japan ends in March and starts in April, and the first week is in the spring holidays. So if you visit an airbase on the first week, there is a high chance that you'll see an empty airbase. The second or third week will be less riskier, because the new financial year will have started and planes will start flying again. I did, are you receiving my responses? > I've just send an email just now. If you don't receive it, could you please check your junk email folder? My compliments with your nice website, I will be visiting Japan first week of April. My scedule looks like this.....Monday; Tsuiki, Thuesday; Nyutabaru, Wednesday; Iwakuni, Thursday; Hyakuri and friday; Atsugi. Can you tell me if there are runway repairs during this time?? or maybe some other info wich can be important? I've just send an email just now. If you don't receive it, could you please check your junk email folder? Good to hear from you. Did not receive e-mail so far! > Hi Mario-san, sorry for late. > I've just sent an email to you. Hi Mario-san, sorry for late. I've just sent an email to you. Are you there? Haven't heard from you for quite a while. > I'll try to find out new color shade. I'll try to find out new color shade. About the news about cancelling the F2 project, I believe it is still under discussion. No one knows the result at this point. But I think all JSDF projects will be reduced in a next few years. I think the total purchase of F2s will be under 100. Some of them are specified using Japanese paint manufacturer's code. so I'm asking the manufacturer to get a good English document to convert the codes into standard colors. When I get it, I will make new page. Hi Kazuo! i don't know if you remember me, i am Ernesto from Argentina, last year I asked you some questions about JSDAF and the F2 project, wich you answer me ( thanks again!). Can you give some information about thath? Will the project be cancelled ( nooooo!!!) or just less planes will be build? If that's the case, how many of them? AND have you finally found some color schemes of F-15Js? I've found one of a DJ model...I can send it to you if you want:)! If you have, could you please tell me the site? THANKS!!! and therefor we are looking for movements from various airbases of the USAF in Japan. Is there someone who can help? I'd just like to know if there is a good site about F100 engines. I'm searching myself but I can't find any. It's OK in both English or Japanese. There is nothing different about the layouts from the C-type. May I ask if there is anything that makes you think the J-type has different layouts? Due to my poor English skill, I could not enough understand what DEP is. Sorry if I misunderstand but F-15J's cockpit layout is basically same as F-15C-21MC. I am looking for teh side and top view of a F-15J cockpit arrangement. I am looking for either the dimensions of the pilot position (DEP) and the postion of the stick, throttle, pedals, seat and side and front consoles. Some excellent websites - thanks Javi. Still trying to find more - now have found evidence of 5 - they are 963, 832, 957, 930 & 955. Any more information much appreciated. Thanks for your prompt response Kazuo. Have now identified 963, 955 & 930 as White Dragons - have looked at your photos on the TAC page & can't see of 957 as a White Dragon. Does anyone have anymore information on these markings - were they for 2003 only & did the aircraft just fly in pairs or did they fly all together?? Will post photos of the models when finished. Hello Jason, sorry for late. I verified some photos in TAC MEET 2003, and found 4 White Dragons, 930, 955, 957, and 963. These Dragons are slightly different because it was painted by hand. F15-J "White Dragon Shiro Ruyu" 303rd TFS display team. (the ones with white dragon on the top surfaces). Have identified one as F-15J 72-8963 - but not sure of identity of the other - could be 42-8832 or 42-8833. Any help would be would be much appreciated - as building a pair of jet powered R/c 1/9 scale F-15's and want to paint them in these colours. Sorry for late. I'm not a collector, so I don't know good contacts. I hope someone else can help you. Do you or any of your contacts know where I can get hold of official Squadron patches for Japanese JASDF units? I've been collecting patches for 10+ years and still have a growing collection. Could do with help getting hold of patches. Yes the F-2 is going to be cutback. Noone knows about the replacements for sure. But I don`t think it will be more F-15Js, they`ve already stopped making them. It may be something like the F-15E or something. Another possibility is a downgraded F/A-22 or F-35. 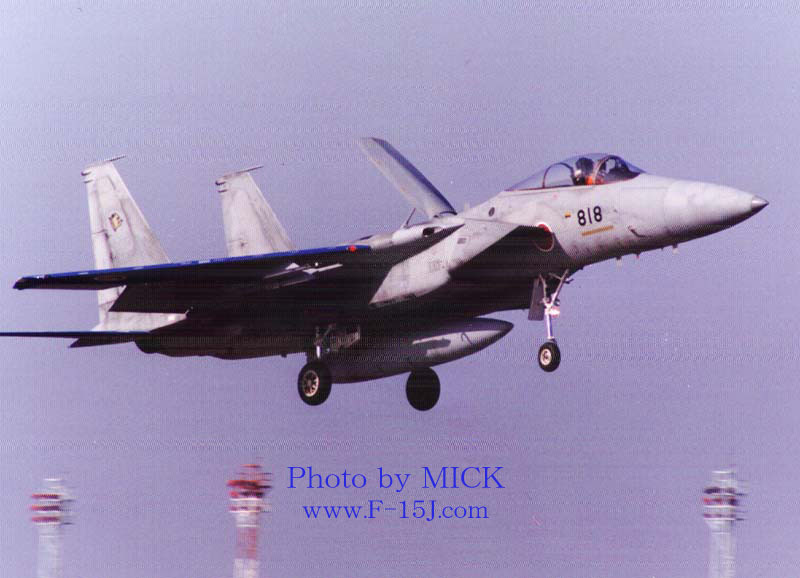 I heard that that the new F-2 is going to be cutback, because of its spiraling cost is approaching that of the F-15J. So is the Japanese Air Force going to buy more F-15J Eagles instead, you think? Also, wouldn't the Grumman F-14 Tomcat been a better choice, if Japan gone with it instead of the Eagle? Hello Javi-san, sorry for late reply. I was asked 818's photo originator but still no response. Could you wait few more days? > Mr.SG sent me a AAM-4 photo. I put it to the bottom of http://www.f-15j.com/archive/mecha/mrm/mrm.htm . It is not a dummy. I hope it help you. I have some doubts concerning faker machines. * the year 908 acted as faker for the 204 Sq with green-painted wings and tailplanes. > If you mean the avionics bay behind the pilot, it's white, but the box with the avionics stuff in it is black. > It's not only 963, all the F-15Js are like that.